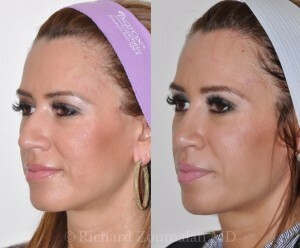 This young woman wanted her bump removed and to have a very natural looking nose. 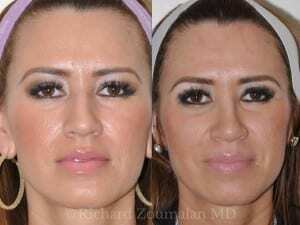 She underwent Rhinoplasty by Dr. Zoumalan. Due to her ethnic features, pre-operative profile imaging allowed her to communicate with Dr. Zoumalan. With our 3D imaging software, the patient and Dr. Zoumalan were able to agree on her desired look, as well as her desired goals. 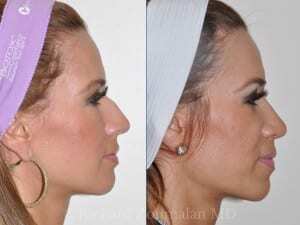 She preferred a straight profile as much as possible. Giving her a “scooped” look would look unnatural. A natural appearance is the appearance we seek to give our patients. Her new profile was designed specifically for her face and to match her unique features. Her tip had to be restructured as well, in order to match her new profile.